Government departments should draw up plans for 40 per cent cuts, the coalition government has warned - even though not all will face this much pain. 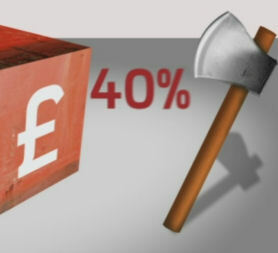 The axeman cometh, says Channel 4 News's Carl Dinnen. Chancellor George Osborne has ordered cabinet ministers to draw up plans for the 40 per cent spending cuts, which will include slashing services and axing hundreds of thousands of jobs. The instructions will come in a letter from Treasury Chief Secretary Danny Alexander, in the latest step in preparing for what is set to be the toughest spending review since the end of the Second World War. Officials stressed that the 40 per cent figure only represented "initial planning assumptions" and many departments would not face cuts of that scale. However, some will - and that fact alone gives a sign of how severe the cuts could be. The Office for Budget Responsibility has already forecast that 600,000 public sector jobs will be lost as the coalition tackles the deficit. The chancellor warned in his emergency Budget last month that departments faced cuts of around 25 per cent over the next four years on average - apart from health and overseas aid, whose budgets were ring-fenced. It is understood that the Ministry of Defence and the Department for Education have been instructed to draw up plans on what impact cuts of 10 per cent and 20 per cent would have. The rest of Whitehall has been told to prepare for cuts between 25 per cent and 40 per cent. A Treasury spokesman said: "We are determined to tackle the record budget deficit in order to keep rates lower for longer, protect jobs, and maintain the quality of essential public services. "The Cabinet has been briefed on the planning assumptions that their departments should use for the initial phase of the spending review. "These planning assumptions are not final settlements, and do not commit the Treasury or departments to final settlements. "These assumptions will be negotiated so that we both tackle the deficit and support the freer, fairer and more responsible Britain we want to see." If anyone doubted how much the coalition government had it in for public spending, doubt no more, writes Channel 4 News's Carl Dinnen. The Axeman Cometh, or at least he writeth a letter to his colleagues asking them what 40 per cent cuts to their departments would look like. Not too pretty, one imagines. Former Home Secretary Alan Johnson has already said the Home Office couldn't take that kind of a hit without police numbers being affected. The Transport Secretary Philip Hammond says his people will still fill in your potholes, but there won't be much money at all for new roads or rail links. The unions aren't happy of course. Bob Crowe of the transport union RMT says these kind of cuts would mean not only new lines not getting built, but also services being cut and safety margins thinned. Health and International Development won't be touched, Education and Defence have been asked to look at 10-20 per cent cuts. But everyone else is looking at cuts of somewhere between 25 and 40 per cent. The upper end of that is a worst case scenario, but even the best case scenario is going to hurt. No wonder the coalition is letting us know what's coming. How easy is it to make efficiency savings?